Today’s recipe is part of the Mom’s Crazy Cooking Challenge. We had to make fried chicken. Normally we have to pick fried chicken from another blog, but this month Tina let us create out own recipe. So with all that I decided to make Buffalo Chicken Fingers! Oh baby!! These chicken fingers were fabulous! Crispy, slightly hot and healthy for chicken fingers. Yes, I said healthy! I decided to bake them instead of frying them. I don’t like cooking with oil, and I don’t need any additional fat, I eat enough of that with the trillion spoonfuls of peanut butter I eat! 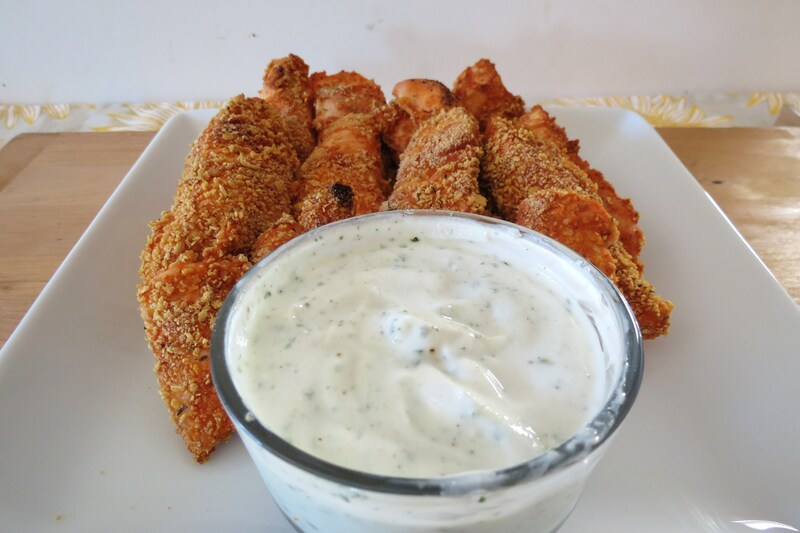 I served my chicken fingers with my yogurt ranch dressing which is a perfect complement to the chicken. My Husband loved this dish! Chicken fingers is one of those foods I love but I just never make them enough. 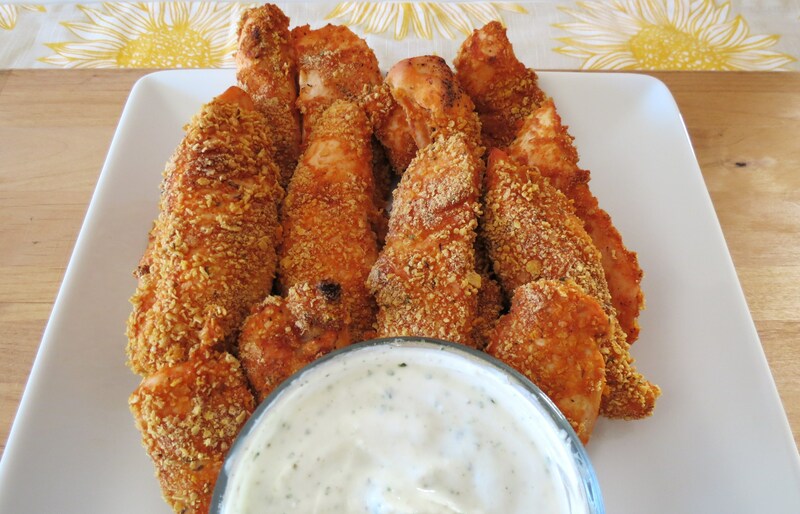 The last time I made fingers was for the Super Bowl, remember my breaded chicken fingers? They were a pretty popular post for a month or so. This recipe is a take on them, but with hot sauce! Yum! I soaked the chicken in milk and hot sauce for about 6 hours. Then I dipped them in a mixture of Franks Hot Sauce and butter. For the breading I used Organic Corn Flakes and spices. I placed them on an aluminum foiled baking sheet with a rack over the top. Baked them in a 400 degree oven for 30 minutes and they turned out perfect!! 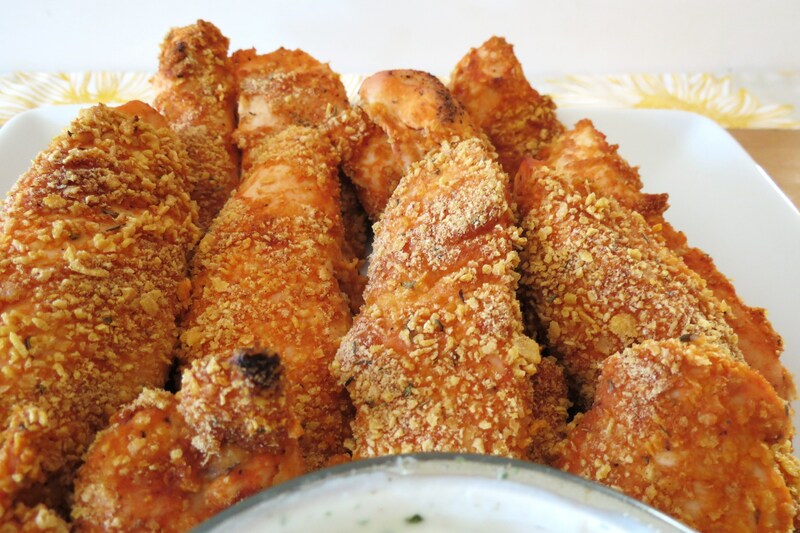 A crispy, spicy healthy version of traditional chicken fingers made with hot sauce and breaded with corn flakes and than baked. Whisk milk and hot sauce in a shallow glass dish until well blended. Add chicken and turn to coat. Cover and marinate in the refrigerator for at least 30 minutes or for up to 8 hours. Preheat oven to 400 degrees F. Line a baking sheet with foil. Set a wire rack on the baking sheet and coat it with cooking spray. In a shallow bowl add ¼ cup hot sauce and butter, mix until combined. 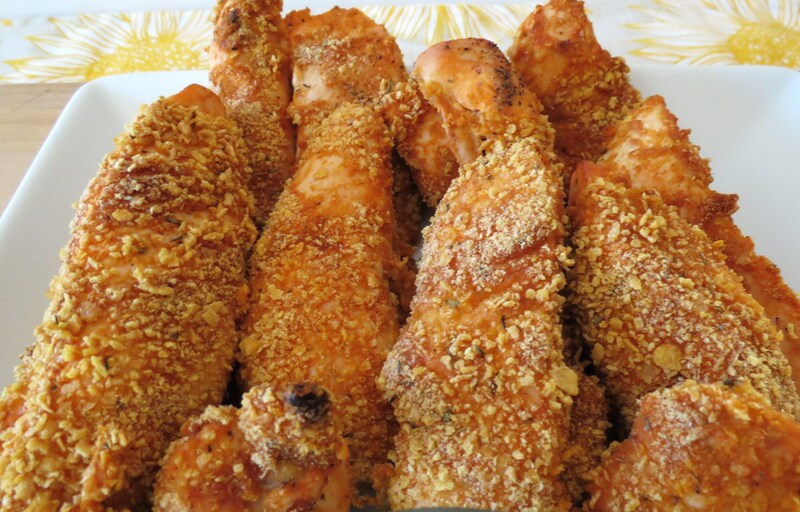 Take your chicken out of the milk mixture; dip into hot sauce mixture and then dredge in breadcrumb mixture. Place chicken on rack and bake for 30-35 minutes, until chicken is fully cooked and crispy. I want to thank Tina from Mom’s Crazy Cooking for hosting this wonderful hop. I had fun making these fingers, but more fun eating them! Your chicken fingers sound spicy delicious. Hope you are having a good flight/trip. Ohhhh, going to check out your copycat recipe!! My Husband loves KFC!! Love that these are baked and not fried. And of course, I’m all over the spice! YUM! You have to love spice! Going to check out your chicken dish! have a great day! Have a safe and wonderful trip!!! These look really yummy. They look like something I would feed my family on the weekend. Love that they are spicey and healthy at the same time. I am off to figure out where you are going! I love these chicken fingers too! I really don’t know why I don’t make them more often? 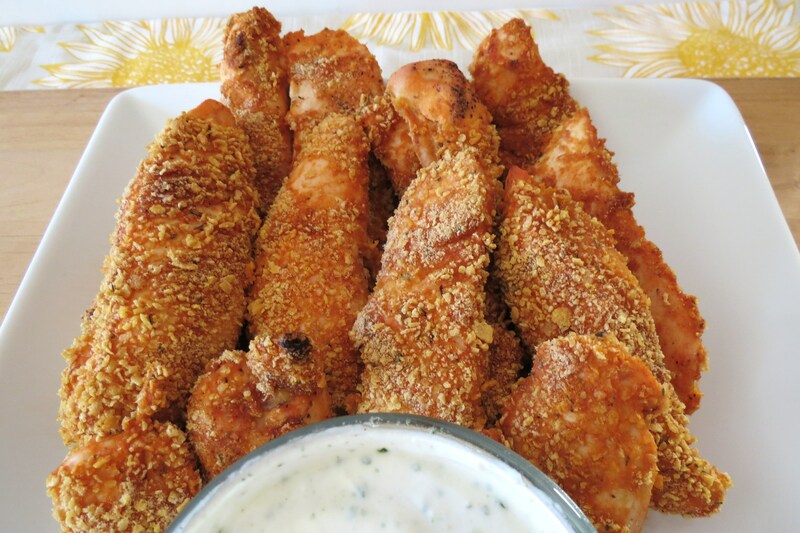 These chicken fingers look delicious! Have a really lovely trip, I’m so jealous! Yum! Love anything with Frank’s hot sauce. Great choice for The Challenge! I agree I love Franks Hot Sauce!!! Going to check you out!! i just tried these….and they were awesome….!!!! and healthy…. !wat more could i ask for…!tnk u so much…. !